This is not a political blog, far from it. But the very values that I live by, and espouse on a daily basis, the ethos of sharing and building connections in communities, the feelings of kindness and acceptance in all our neighbourhoods, are under attack, seemingly across the world, right now. I call this the Anti- movement. Anti-Women. Anti-GayMarriage. Anti-EthnicDiversity. Anti-Immigration. Anti-Muslim. Anti-Jew. Anti-Tolerance. Anti-Social. Well, I’m Anti-Anti. As the dust settles, but the dirt rises, it is a timely reminder for all of us that there are moments in history and society when the single person and small acts can effect change. I believe this so strongly. In our communities across the world, we must gather with friends, families and neighbours, and show solidarity. Be kind, even kinder than before. Be tolerant, even more tolerant than previously. Be generous, even more generous than yesterday. Maybe bake a cake or make a salad to share it with a neighbour for no reason at all, other than the understanding that giving gives joy. This week is all about giving Thanks here in America. And we do have lots to be thankful for. That’s an important message too. No matter how vile the political climate is right now, we should still remember the good things we have in our lives. This week, I am thankful for the kind, inspiring, diverse and fun friends we have made in Brooklyn, and the laughs we share on a daily basis. We are hosting Thanksgiving in our house again this year, which I’m pretty excited about. I thrive on holiday entertaining. I’m thinking vegan chestnut soup with crispy shiitakes, honey Brussels sprouts with lentil & quinoa pilaf from my book Neighbourhood, this Green Bean Casserole, and a mac ‘n cheese topped with tater tots (absolutely inspired by Molly Yeh). We will finish with sweet potato pie and for our Aussie twist, pavlova, of course! 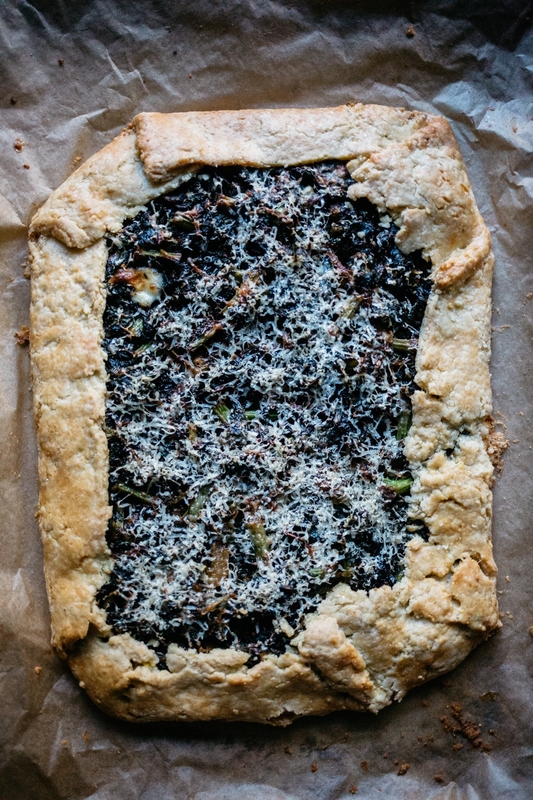 If you are still looking for a veg-centric main, perhaps this slab galette will do the trick? The cornmeal dough is super surprising, adding a lovely crunch. This recipe was adapted from here – I used kale, but you could use any hardy green leaf you desire such as cavolo nero (lacinato kale), chard, silverbeet or spinach. To make the dough, I used my Kitchenaid mixer, but you could also use a food processor or tackle it by hand. In the bowl of the mixer, with the paddle mixer attached, add the flour, cornmeal, sugar, and salt, and mix on low speed. Add the chilled butter and mix on low speed until it is evenly distributed but still in large, visible pieces. Add the olive oil and beat briefly. Add 4 tablespoons of the ice water and mix – the dough will start to form. Keep adding more water by the tablespoon until the dough comes together. Place the dough onto a piece of plastic wrap. Roughly shape the dough into a rectangle, wrap in plastic and refrigerate for at least 1 hour or overnight. In a large pot, heat the oil and add the sliced onion. Cook, stirring frequently, for about 10 minutes until lightly browned. Season with a pinch of salt. Add the garlic, red pepper flakes, fennel seeds and paprika, and cook for 30 seconds. Pile in the kale, adding as much as you can, add another pinch of salt and a drizzle of olive oil, cover with a lid and cook for 4-5 minutes, until the leaves are wilted (if you can’t fit all the kale into the pot at once, wait for some of it to wilt and then add more to the pot!). Uncover the pan, use tongs to rearrange the leaves and continue cooking until all the liquid has evaporated. Taste and add more salt, if required. Add a turn of black pepper. On a large sheet of baking paper, place the cornmeal dough in the centre and, using a floured rolling pin, roll it out into a large rectangle, about 12 inch x 16 inch is ideal (make sure that when the edges are rolled in, that it will fit into the baking tray you are using!). Once you are happy with the size and shape, transfer the baking sheet with the dough onto a large baking tray. Spread a thin layer of ricotta onto the bottom of the dough, and then pile the kale mixture on top in a thin, even layer. Sprinkle the grated cheese over the top. Fold the edges of the dough inward over the filling, pinching together any tears in the dough. Brush the egg wash over the exposed crust. Bake for about 35-45 minutes, until the crust is evenly browned. Slide the galette onto a serving board and allow it to cool for about 10-15 minutes. Cut the galette into 20-24 pieces and serve.